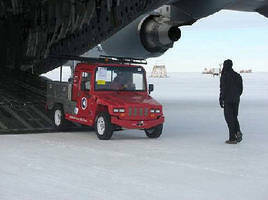 The National Renewable Energy Laboratory (NREL) has begun testing the performance of two electric powered utility vehicles from e-Ride Industries under the extreme conditions of Antarctica. The EXV2 models will face temperatures down to -50F at McMurdo Station. If they perform well, the largely diesel powered fleet of vehicles at the station could start being replaced with more efficient and less resource intensive EVs. The cost of transporting fuel to the station is expensive and there are pollution concerns in the largely pristine environment. The station already has renewable solar and wind energy to power the vehicles. While technically not a STOV since it is a pickup truck, I thought this story of innovation on the farm was interesting and could be applied to a STOV just as easily. A farmer in Oregon, with the help of a friend, converted a diesel pickup to an all electric. While this is not common it has certainly been done before, but the real innovation was developing a remote control to operate the truck. Not only does the truck save on fuel but operations that required two people could now be managed by one. …Feeding cattle is now a one-man operation, saving on hired labor. Anderson can start, steer, throttle and stop the truck with a hand-held remote control device from up to 500 feet away. He can feed off the back while driving with the remote. He can also honk the horn from the remote if cattle get in front of the rig. Driving through gates no longer requires a second person to keep the cattle from running into the next pasture. As an added benefit, Anderson said that during calving he can check the cows at night without disrupting them because the truck is so quiet…. A couple of the few remaining states without LSVs law are in the process of debating LSV bills. More municipalities pass ordinances allowing the use of LSVs on public low speed roads. The Midwest and North Carolina are the most active areas. Safety and congestion are a consistent issue during debates over LSV ordinances. Ordinances allowing use of off-road vehicles on public roads generate both support and resistance. Mississippi – Some residents are asking the state legislature to pass a law allowing the use of LSVs on public roads. Nebraska – A bill is moving through the state legislature that will allow for the use of LSVs on public roads. This year’s bill excludes golf cars. Virginia – A bill will likely become law that expands the mobility of golf cars and utility vehicles. While the bill is restricted to the town of Colonial Beach, it does set a precedent of allowing the vehicles to cross state highways at designated golf car crossings regardless of the state highway’s speed limit. Currently there was a speed limit restriction of 35 mph. In another bill the state’s parks departments will be able to use golf cars and utility vehicles on roads adjacent to parks as long as the road’ speed limit is 35 mph or less. New York – A bill is moving through the legislature that would redefine all terrain vehicles (ATV) to include side-by-side utility vehicles that weigh as much as 1,500 pounds, raising the limit from the current 1,000 pounds. This would allow consumers to register the vehicles and use them for recreational riding where allowed. Waynesville, MO – Councilmen is urging the city to look into an ordinance for LSVs on city streets. Town officials want to know more about LSVs and the issue of crossing of state highways. Kansas City, KS – An ordinance was not repealed, which would have allowed residents to operate all-terrain vehicles, micro utility trucks, work-site utility vehicles and golf carts on the city’s streets that feature speed limits of 30 miles an hour or less. The issue may be revisited since the vote was close and the mayor wants more consensus. Columbus, NE – City officials did not pass a bill that would have allowed expanded use of UTVs on public streets. Concern about the vehicles operating in higher volume and higher speed traffic was the issue. Muskego, WI – City officials are discussing allowing LSVs on public roads. Issues of concern are safety and traffic congestion. Pardeeville, WI – A committee recommended to the full city board a proposal to allow LSVs on public roads. Columbiana, OH – City officials are considering an ordinance to allow LSVs on public roads. 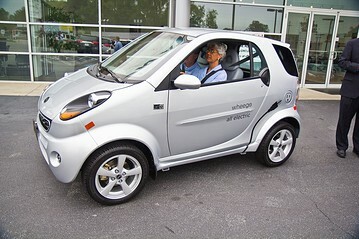 La Grange, NC – An ordinance was passed allowing golf cars and LSVs to be used on public roads. Traffic congestion is a concern. Landis, NC – Town officials are planning a town meeting to discuss an ordinance allowing the use of LSVs on public streets. Oak Island, NC – The city council had been discussing allowing modified golf cars on public roads but decided not to pursue an ordinance. The city already allows LSVs. Rockport, TX – City officials pass ordinance that allows golf cars and LSVs to be used on public streets. Juneau, AK – City officials are proposing a code change to allow LSVs on public roads, in part to allow the US Forest Service to drive to and from their offices using an electric vehicle they are planning on purchasing. The ordinance includes a provision that drivers pull over if traffic builds up behind them.